Çayeli Bakır is located on the Black Sea coast of Turkey approximately 7 kilometers inland from the coastal town of Çayeli and adjacent to the town of Madenli. For over 20 years Çayeli Bakır has produced copper and zinc concentrates from our underground mine that we market and ship to our customers throughout the world. The demand for the commodities that we produce is largely driven by consumers of electrical and electronic products. Our employees provide value to our Company through their ideas and efforts, we in return give value to them. Çayeli Bakır values our employees over the commodities we produce, truly “Our employees are our real ore”. Our mining activities are reliant on the ongoing support of our surrounding community, the authorities, our contractors and suppliers. Surrounded by tea plantations and situated in a semi-residential area of the picturesque Büyükdere Valley the location of our mine is not a typical mining landscape. We have adapted our mining practices to suit this unique environment and this has resulted in the creation of a Company with a unique set of operating practices and internal culture that we are all happy to be part of. 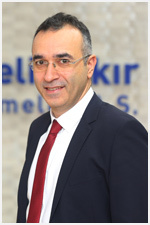 Çayeli Bakır is a leading company in our sector and we are more than willing to share our practices with other interested parties who share our aim of improving the reputation of the mining industry.